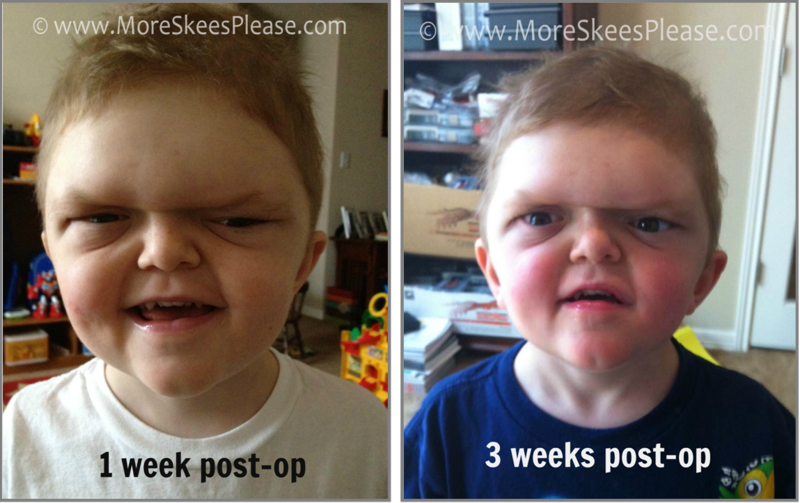 It has been three weeks since Aiden's cranial vault surgery and he is doing great! Despite the fact that the swelling and incision in his head appeared to be painful - I have no reason to believe that Aiden experienced much pain during his recovery. He never complained about it hurting once! The thing that was most difficult for him was the frustration of not being able to see for 5 whole days after surgery. We were not expecting his eyes to be swollen shut for that long. Because of the stitch placed in the corner of his eyelid, he was not able to open them on his own while the swelling was still substantial. However he started to pull down on his eyelid and soon realized that if he did so, he could see through a small sliver of an opening. In fact, he wanted to watch the KY Derby (on DVR) so badly and that is what sparked this breakthrough. When he pulled it down and saw the horses he got so very excited, yelling "I see horsies mommy! I can see!" It was a goose-bumps kind of moment. We kept him out of school the entire week post-surgery for obvious reasons. However his personality and determination bounced back very quickly. As soon as he started being able to see without having to physically pull down his eye-lid, he was more than ready to head back and see his friends. So 2 weeks post-op, back to school he went! When I dropped him off, many of his friends commented on his appearance, which I expected. While Aiden was gone, the teachers in his class and Ethan's class shared information about his surgery with the kids and showed them pictures from my blog. I think this helped ease some of the concern and questions, but they were still ready with comments nonetheless. "He looks angry. Why is he mad?" was what we got mostly. I explained that because of his operation, his forehead looks a little different and is swollen. I assured them he was not angry, rather he was in fact very excited to be back with his friends and ready to play. I told them the swelling would go down over time and he wouldn't look so "mad" anymore. One little girl piped up and said "Aiden will you still play with me on the playground?" Aiden smiled and said "Yes!" And that was it. I knew he would be fine. We've been sending weekly post-op pics to Dr. Fearon and his nurse Cindy to make sure all continues to look well. So far, they are very pleased with the progress, saying that the amount of swelling is as they would expect each week. I have voiced my concerns that the brow bone seems to be much lower than I originally imagined it. I'm hoping that Aiden's big bright eyes are not inhibited by the placement of the bone as it seems he is still unable to open them all the way. Dr. Fearon and Cindy have both said the appearance will improve as the swelling continues to go down - noting that it may take several more weeks. I was reading this just now, and my 4 year old son looking over my shoulder said, "Mom, who is that?" (and yes, he is still up....I know, crazy.) I said, "that's Aiden". He said, "He looks mean." Then, I read the rest of the post and read that other kids said this when he returned to school. So, I thought I would share. I, of course, explained that Aiden was not mean....and I hoped he would see him sometime at the gym! Thanks for sharing. That's so fantastic! I'm so glad that things are going well, and that he's in chipper spirits during his recovery! Best wishes for a continued successful and full recovery! I'm so glad you posted this! I was just thinking about Aiden this morning, wondering how he was doing this far out from the surgery. Glad to hear (and see) that his recovery is progressing nicely. BTW... I will be near your neck of the woods next week! We're going to Salado (actually staying in Killeen) on Monday and for a couple days or so. I did some research and it sounds like a fun little artsy community. I've heard good things about it, so I'm looking forward to it AND I could really use the break!